Now Warner Bros. have released the oddly named “Complete Motion Comic.” It is a strange title, but it is actually completely accurate. What they have here is a comic of Watchmen which has some minor animations (think Flash animations) and a narrator reading all the text. Personally, I loved it. I can now see why Watchmen had such a strong following. Watchmen actually is incredibly unique and it comes across much, much better in comic form. Since I didn’t read the original comic I can’t draw a comparison, but this has new graphics that parallels the movie perfectly. I am to understand the movie likewise paralleled the original comic so what we have now is a comic about a movie about a comic. Weird (like everything Watchmen) but it works. The greater understanding comes from being able to read what is being said as it is said, and greater exposition. Not a word is wasted and when you have a movie like that if anything that is even remotely unintelligible (say because Rorschach has a gravelly voice) you will miss something important. These compound over time until by the end of the movie you are thoroughly confused. 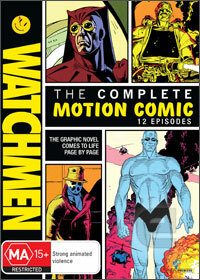 I found I could follow along, but compared to Watchmen: The Complete Motion Comic, I was watching it with my eyes shut. The animations are very simplistic – think “flash movie” – and there is one guy (Tom Stechschulte) narrating the whole thing so the women’s voices in particular are quite grating. Still, it all works together and to me a nice augmentation over just comic stills. I have to wonder why one would buy this and not just the original comic, but then, I didn’t buy the original comic and I did watch this quite happily and felt all the more enlightened for it, so go figure. The scores I gave it I have judged very high in comparison to contemporary animation, but that’s a lot of “style” bonus because it is an entirely different thing that it is going for. If you can pick it up cheap or rent it, I would, it works well.